Opinions are cheap. Facts are expensive! Lockheed Hercules 63-7789 is no longer missing the real Paul Meyer story is coming home. 6 Comments on Lockheed Hercules 63-7789 is no longer missing the real Paul Meyer story is coming home. In some ways finding the aircraft was the easy bit (HaHa). We now have a real task ahead of us but as usual we will come at it straight and level whatever it takes. We will treat the aircraft remains as if it were a crime scene the first job being to map out and image not just the main site but the various pieces we can see on the sonar around the site. Already it is obvious we will learn a lot from what is still there after fifty years however the work is going to be painstaking as we reverse engineer the sequence of events. We cannot do this alone we require folks with specialist knowledge and we are working on that very hard right now. Having located the aircraft we can already dispel a lot of stupid rumours and conspiracy theories which is certainly half the battle won. It is though fairly obvious that many facts regarding that day have been withheld and it would be a really good idea if someone got the file out and started talking to us before we start to tell the story our way, trust me we have a David and Goliath situation here and we will stop at nothing to figure this sad story out. Wow Well done to everyone on the team on the finding of 63-7789, I look forward to following your investigation and finally hearing the truth and seeing the remains of the Aircraft. Many thanks for your interest David it has been a long road and we still have a way to go yet but we will get there in the end. Are you by any chance based in Paris? 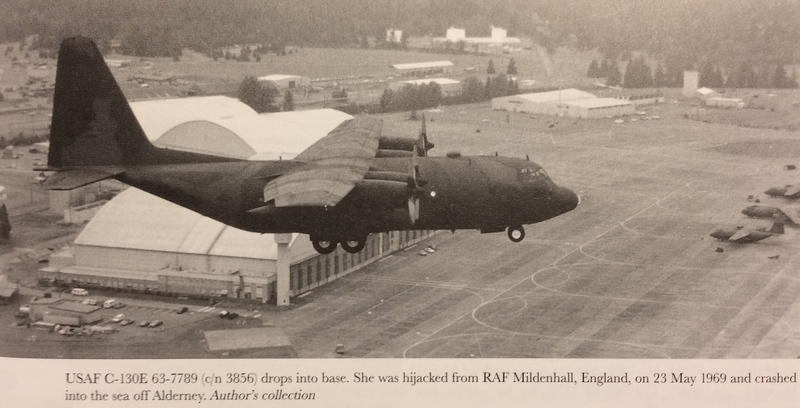 I was stationed in Mildenhall in the winter of 1969 with a C-130 squadron from Sewart AFB in Tennessee. There were wild rumors floating around about a crew chief that stole a C-130 and took off for the States and was shot down (speculation) by USAF fighters from Lakenheath or RAF fighter jets. Now I know that it is true after almost 50 years. Read page 53 The Lightning Boys by Richard Pike it might shed some light in your quest for the truth. Though with only an hours flying time I would not have thought a Lightning would have made it to Alderney and back without refuelling. Hi Bob yes we are aware of the book and who the American pilot was, he is still alive. I am afraid the book is shall we say a little over dramatic. A fascinating story, I look forward to hearing what really happened in this sad tale. Deeper Dorset, Proudly powered by WordPress.